Every month, we round 'em up here, the pertinent supply and demand picture. Glimmers of hope as inventories, the dominant issue of the past 2 years showed signs of decreasing. Sales for existing homes actually rose slightly, but this seems to be on the basis of foreclosures. Reaching statistical normalcy is still some months away. Permits, Starts and Completions, (PDF): Declined 37.4%, 31.1%, and 20.4% from Sept, 2007. The Big Picture correctly chracaterized this as good news, to the extent that inventories need to fall, but bad news for the economy. Single family permits, the most leading of indicators were down 38.9% nationally, and 39.8% in the South from one year ago. New Home Inventories, (PDF): In terms of raw numbers, are down 33% from one year ago, and in terms of months of supply, fell to 10.4 months. This is a glimmer of good news, but is still a long way from the 6 months of supply that is considered normal. Existing Home Inventories: In another ray of sunshine, this segment representing 85% of all sales showed a decline to a 9.9 month supply. Again, something like a 6 months supply would be nice to see, so the bottom is a ways off just yet. New Home Sales, (PDF): 33.1% less than one year ago, and 66.6% less than the peak in 2005, with median prices down 9.1%. 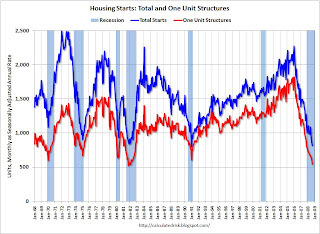 This combination of lower new housing starts, and lower prices will need to persist for some number of months in order to fully rectify the problem of excessive inventories. Putting aside other economic concerns, this is the path to normalcy. Existing Home Sales: Displaying something we have not seen in around 2 years, existing home sales rose 1.4% from one year ago. As Business Week points out however, the sub-story is that foreclosures comprise 35%-40% of transactions on a national level. In the South, existing home sales fell by 7.8% from one year ago. The approach to the bottom will not be difficult to see, since we remain a good distance from historical balance in terms of the numbers. A couple of the September indexes moved in favorable directions for the first time in recent memory, but this is clouded by foreclosures and the wider events since the fall of Lehman Brothers in mid September. Caution and deliberation would seem to be friends here. Sadly, some recent editions on our baby boomer days have noted the deaths of those we grew up with. Isaac Hayes passed away in August, while Norman Whitfield, the Motown Producer behind The Temptations died in late September. This past week, Levi Stubbs, a name most of us will not know, but a voice we will not forget died in his sleep at the age of 72. Stubbs was the booming lead baritone for Motown stars The Four Tops, who had 21 top 40 hits from 1964-1973. Uniquely, The Four Tops did not undergo any changes in personnel from their formation around 1954, until the death of Lawrence Payton in 1997. Because no one loves American soul music like the British, here is what The Telegraph had to say on October 20. Their first song to make the charts, topping out at # 11 in the year 1964, Baby I Need Your Lovin'. The Citizen Times reports today that The White House Christmas Tree will once again hail from North Carolina. According to the NC Department of Agriculture, almost 20% of natural Christmas trees in the US are grown here in Western North Carolina, ranking second only to Oregon. This marks the 11th time that a North Carolina Fraser Fir will grace The White House, and is the second year in a row the honor has been bestowed on our region. The tree was grown in Creston, NC, a bit northeast of Asheville. The tree will be cut on the day after Thanksgiving. Kudos, to The River Ridge Tree Farm. Not much narrative analysis today, just some snapshots, and a closing touch of humor. 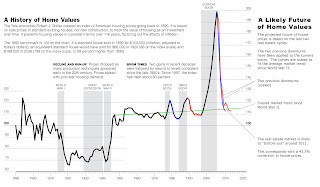 The graph below shows US housing prices from 1890-2006. Bear in mind that the last boom in prices occurred while production and inventories also moved upwards. That's the illogic of a bubble. Click here for the large view. The only logical response by the nation's builders is pictured below, but inventories have not yet declined in terms of months' supply. (Chart Source). If production cuts will not reduce inventories, then the question of prices becomes pertinent. We all know that sales are down drastically. The graph below is but one indicator, it shows the frequency of internet searches for the phrase "real estate for sale". In our view, internet searches will foreshadow any bottom in the housing markets. Have no idea if this is real or not, but it brought a chuckle at the height of the NYSE frenzy. Just some quick outsourcing for Friday, the weekend is upon us. It is being reported by ABC, among others that, a clever virus is circulating via email which directs users to some bogus, but very convincing Youtube pages. In election season, chain emails are of course making the rounds, but be aware. Readers have probably received an email or two with subject headings such as "must see this video", and so on. In short, the page will play the correct video, but directs the user to first download a software update in order to view. It is here that the malicious code is hidden. Spotty supplies are expected for another week or so. We have wide ranges in prices, and in our own town of Mars Hill, the most common experience is that only one grade is available. The average price in Asheville yesterday was around $3.75/gallon. In Madison County, one can still pay $4.10/gallon. Bottom line, availability is no longer a huge issue, but if you are planning to visit, purchase outside of the region for significant savings. By all means check out the latest color forecast from Ashevegas. As you might imagine, a presidential candidate appearing in our neck of the woods is pretty big news. Here are some links recapping the day for those interested. *The Citizen Times reports 28,000 people in attendance. On Friday that paper had indicated the stadium could hold 10,000. They also supply an extensive slide show of the event, here. The Democratic candidate has been in town preparing for Tuesday's debate. *Buncombe County Toursim gives us the latest report/forecast for Autumn colors. Not surprisingly, the amount of color is dependent on elevation. We travel from 2,400 feet above sea level to more than 5,000 feet on any given day. From our perspective, North of Asheville, next weekend will be nice at elevations over 3,500 feet. *92% of homeowners "plan on just staying put" over the next year according to a recent Harris Poll survey. *A basement makeover you can have for a mere $10.00, moderate talent required. Blogasheville has all the details in a neat little package for the 2PM Sunday event. The Democratic candidate for President is spending time in Western North Carolina in preparation for the next debate. Yep, Saturday marks the 41st Annual Bascom Lamar Lunsford Festival in our home town, on the campus of Mars Hill College. Lunsford, the “Minstrel of Appalachia,” is credited with early efforts to preserve the music and culture of the Southern Appalachians. The event begins at 10 AM and runs the gamut from traditional crafts to an evening concert. What About That Gasoline Situation? In Mars Hill itself, availability has improved to a degree. Some locations are empty at given times, and one will usually find just one grade of gasoline. Our friends at Carolina Mornings have the most recent synopsis of greater Asheville gasoline. Bottom line: Availability is better, prices remain high. It would seem best to purchase fuel outside of the region for better prices. Let's take a peek at the contents of Time Magazine on this date in 1964 and see what was up. *The Presidential Campaign was of course topical. *Cover Story: The Warren Commission had issued its final report on the assassination of JFK. *Color television shows were still in their infancy, but touted as the next big thing. *CBS unveiled its new fall line up, although only two of those programs were in color. *Iraq apparently had quite the reputation for political instability. *Viet Nam, still low on the public radar at that point, was not without its troubles. *And, The Beatles, riding the wave of their second American tour, and the film A Hard Day's Night, were big business. If I Fell, from the film, 2 minutes and 34 seconds. Whether we are talking about Asheville's gasoline disruptions, the local housing market, or the national one, these are certainly "interesting times" as the old Chinese proverb says. Let's not delve into any great analysis today, and simply look at some musings and milestones. It turns out that there actually is not an old Chinese proverb to the effect of, "May you live in interesting times." For incurable basketball fans, we offer recent economic developments in a March Madness chart format. Upon examination, it offers insight and hopefully a smile amid the turmoil. The Wi FI Bathtub makes its debut from the National Association of Home Builders trade show in September. If the cost of gasoline or outside obligations are keeping you from your vacation home, take heart. Now you can kill two birds with one stone as they say, and use that web based security system to visit your second home from home. Once laughable as a prediction in some circles, the national debt will exceed $10 trillion today. The news is mixed however as foreclosures begin to hit the high end of the market, but the $27 martini remains unscathed.